The Jandy Legacy Natural Gas Pool Heater is a technologically advanced unit that is energy efficient, lightweight and extremely reliable. 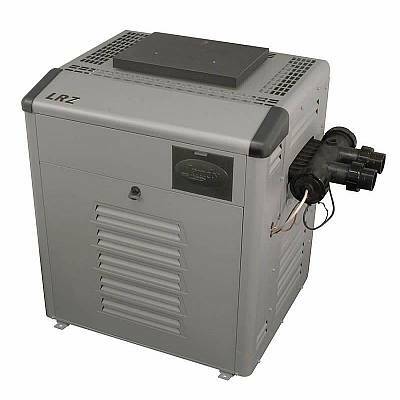 The Legacy uses a ceramic combustion chamber that provides more efficient operation and allows the heater to be smaller and lighter than most other pool heaters. Therefore, the Legacy will fit in tight equipment areas and is more easily moved. The Legacy self-cleaning hot surface ignition and sealed controls ensure reliability in extreme hot and cold weather. The unit's copper heat exchanger with patented Flo-thru baffles makes the Legacy efficient, which will lower your gas bills while extending your swimming season. Polymer headers and unions make hook ups quick and easy without the plumbing headaches of metal. The advanced Legacy control features a digital display that allows different temperature settings for pool and spa. In addition, these digital controls are programmable to operate your pump and filter system with built-in freeze protection. This heater is so advanced that it is self-diagnostic, which cuts down on service calls and expense. Precise electronic ignition saves money on gas and is also trouble free, even in high wind areas. These have been discontinued from distribution from us.